Fibromyalgia is a painful rheumatic condition characterized by widespread muscular adhesions and many tender points. 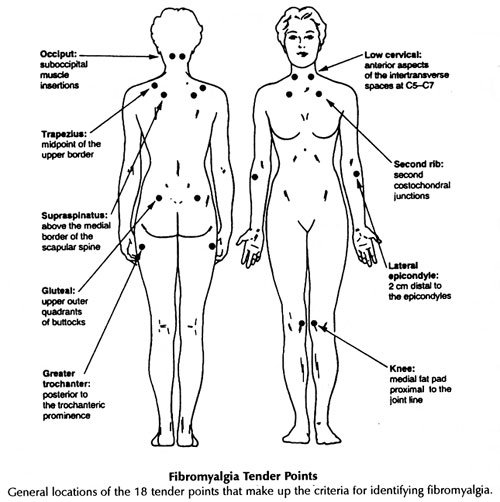 To be diagnosed with Fibromyalgia there must be 11 of a possible 18 tender points on the body, both sides as well as upper and lower parts of the body. This distinguishes Fibromyalgia from other conditions such as chronic fatigue syndrome, myofascial pain syndrome and other various forms of arthritis. It is estimated that Fibromyalgia affects from 2-6% of the population with no obvious origin of the pain. Women suffer fibromyalgia approximately 4 times to 1 for men and can occur at any age even in children and elderly. The cause of fibromyalgia is not known however there seems to be a connection with immune abnormalities and genetic predisposition. Although fibromyalgia is not life threatening it can severely impact a person’s quality of life. Some people can become quite debilitated and have difficulty keeping a job or participating in physical activities. Up to 85% of fibromyalgia patients suffer chronic fatigue syndrome. Treatment would focus on managing symptoms and pain, reducing any pain or discomfort. Reducing stress can also help. Physiotherapy, massage and acupuncture can all help treat and manage symptoms. Chronic Fatigue Syndrome is distinguished by persistent fatigue that does not resolve and severely reduce activity level for at least six months. Chronic Fatigue Syndrome seems to be a widespread problem in North America and is thought to be related to some viral or infection source. It is closely linked to Fibromyalgia and approximately 85% of Fibromyalgia patients have chronic fatigue syndrome. If you have any questions about Fibromyalgia or Chronic Fatigue Syndrome contact our staff at Dynamic Physiotherapy. Is direct billing available to insurance? Direct billing is available to some insurance companies. Currently most plans from Sunlife, Great West Life and Manulife (beginning Jan.1.14) offer direct billing. All insurance plans related to Motor Vehicle Accident claims allow direct billing. If the claim is an accident that is work related, Workplace Safety and Insurance Board also allows direct billing.